With just 10 days before the NPL Europe 2016 spring summit kicks off in London, CoStar News speaks to three of the key companies participating to hear their thoughts on the dynamics of the European non-performing loan market space. Reinout Van Riel, Propertize’s Chief Portfolio Officer, in discussion with the event organisers, SmithNovak, offers his perspective on the current state of the market. “At the same time,” continued Van Reil, who is chairing the conference’s first session which will examine the de-leveraging progress of Europe’s bad banks, “the pressure on some European banks to address long-standing NPL portfolios has also increased, with the belief that high NPL ratios hamper growth possibilities in economies where too much debt is being kept on bank balance sheets, potentially at unrealistic values. Pradeep Pattem, founding partner and chief investment officer at Park Street Advisors, a newly-confirmed participant at next week’s conference, said: “We have seen significant reduction of portfolio sales with vast majority of remaining assets requiring bespoke solutions. After some very large transactions in 2015 in the UK, Ireland and Spain, investor focus has shifted to the Netherlands, Italy and CEEMEA. Mark Edwards from Ashurst, the international Legal Firm and Main Partner of the NPL summit, also commented on the increasing levels of activity in new markets and new asset classes. He said: “The significant year-on-year increases in the volumes of NPL deals between 2011 and 2014 left many commentators speculating 18 months ago as to whether 2015 would represent the high tide mark for portfolio transaction volumes in the European market. “In fact, market indicators suggest that European loan portfolio transaction activity will remain buoyant for some years to come. “Whilst NPL activity remains strong in UK, Ireland, Spain and Italy, there is a discernible shift in focus to new jurisdictions such as CEE, Austria, Portugal and the Netherlands. “Additionally, in the more mature markets we are seeing a diversification of asset-classes away from commercial real estate to more granular SME and residential property assets together with rapidly growing volumes of performing book transactions. 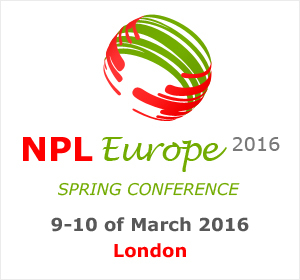 With over 300 attendees already registered from all over Europe, the NPL Europe 2016 spring summit is shaping up to be one of this year’s major events in the non-performing loans calendar. To ensure you do not miss out on the limited number of delegate spaces remaining, please contact the Organisers at smithnovak.com/nplspring or email at contact@smithnovak.com. Gallery | This entry was posted in Market Trends, People, Private equity real estate and tagged NPL Europe 2016, Propertize, Reinout Van Reil, SmithNovak. Bookmark the permalink.